The next quilt up is the one I tend to refer to as "Playing with Scale" though really that's about as dull as a quilt name could be. I think it's jumped the queue, but it came to hand and I couldn't be bothered to overthink, so just got on with sandwiching instead. I was keen to maintain momentum this year. That's just a fancy way of saying that I wasted a lot of time in 2018, just fiddling and faffing and browsing online, with no one to blame but myself but this year I want to do less of all those and more quilting again. Well it didn't work quite like that. I found a new-to-me batting that I fancied trying out and ordered some as I was binding the Hourglasses. Ten days later and I was twiddling my thumbs and feeling rather grumpy, so I rang to check the status of my order. It had gone out the previous day and was with me 24 hours later. Now, I am not telling you this to complain about slow service. Rather it gave me pause for thought. We get so used to things happening so fast nowadays that it becomes an expectation. But lots of things I need come from small, independent shops rather than huge concerns and it's not always possible for them to be as quick. One pair of hands can only do so much in a day, after all. I shall try to be more patient next time, or plan further ahead! The batting, by the way, is lovely and soft, slightly flatter than the others I have used but none the worse for that. I have the same issue of spending too much time online. What a waste. But it often gives me inspiration. Enjoy your stitches! Falling down the online rabbit hole can be a bit of a problem can't it. I too seem to do this. =) Love all the colours in this quilt. Enjoy your hand quilting! You make a good point: we should think about how quickly we need something. Extra time can be well used. I did a bunch of messing around last year. Sometimes it's hard to stay focused. I can relate to the impatience of waiting for shipping and the realization that I have become rather spoiled with almost instant gratification. The way the world has changed and how quickly it continues to evolve is mind boggling when you pause to consider it. When I read "Playing with Scale" I thought of music scale, so not a dull name at all. I am trying to strike a balance this year with getting things done and visiting the people I like along with a few new ones online. Glad you like the new batting. I wonder what it would look like after you finish quilting. Love the close up photos, as always. Good comments on the service side of things Kaja. You speak of Playing with Scale possibly having jumped the queue, good or bad depending on how long a queue you have! Looks like a wonderful quilt! Nice, cozy color scheme and friendly plaids. Yum! What kind of batting is it? Cotton, wool? And yes, it's easy to flit away time. Your hand stitching looks great as always. I am glad you got your batting and the quilt is looking so comfy! 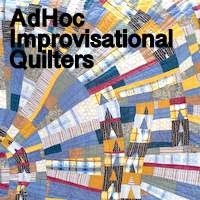 I need to get some hand quilting done myself. Too much to do! So pretty... I see aqua coloured thread.... FUN!